As cities worldwide struggle to balance the fast growth of vehicle-for-hire apps with traditional taxi services, three Texas markets are providing a test of the regulatory breaking points for Uber and Lyft. Fingerprinting drivers can be a deal-breaker. As cities worldwide struggle to balance the fast growth of vehicle-for-hire apps with traditional taxi services, three Texas cities are providing an unexpected test of where the regulatory breaking point lies for Uber and Lyft. Houston, San Antonio and Austin currently take different approaches to a key regulatory issue: whether vehicle-for-hire app drivers must undergo fingerprint background checks. The issue has proven pivotal to Uber and Lyft in Texas. Lyft refuses to operate in Houston, where fingerprint checks are required. Uber isn’t currently available in San Antonio, which has a voluntary fingerprinting program. And both companies are worried that Austin is about to become a lot less hospitable. Last October, Austin passed a temporary ordinance allowing vehicle-for-hire apps to operate legally with few restrictions. 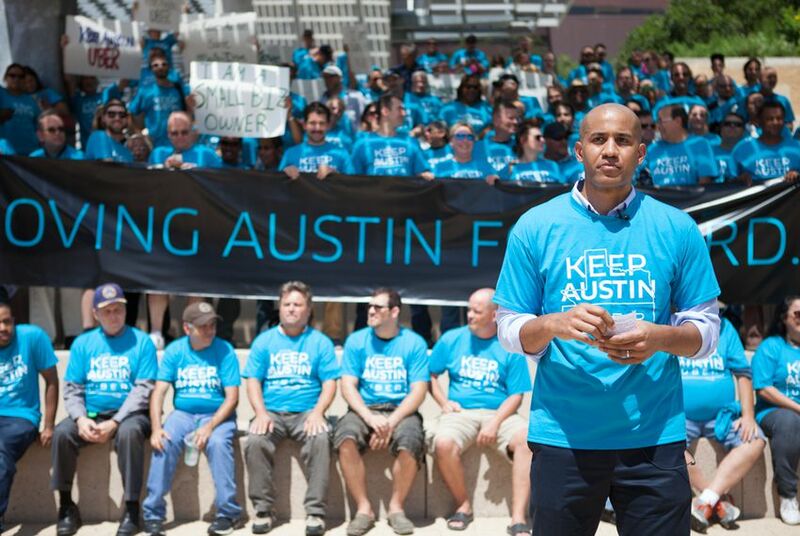 A year later, Austin City Councilwoman Ann Kitchen is leading an effort to tweak the city’s rules, including requiring fingerprinting drivers so the city can conduct more comprehensive background checks than the companies do. Uber and Lyft collectively operate in more than a dozen Texas cities, most relying on the companies to handle background checks on drivers. Officials with both companies have said fingerprint requirements are too burdensome. Drivers working fewer than 20 hours a week are critical to the reliability of their services, they say, and requiring them to visit an office to be fingerprinted dissuades many from signing up. Neither Uber not Lyft officials would say for certain what they will do if Austin adopts a fingerprinting requirement. Their recent experiences in Houston and San Antonio show different approaches to the issue. Houston is one of Uber’s only markets in which its drivers have to undergo fingerprinting. Lyft pulled out of Houston nearly a year ago. “We do not operate in any market that requires drivers to be fingerprinted,” Lyft spokeswoman Chelsea Wilson said. Though Uber is still available there, the company isn’t exactly thrilled with Houston’s policy. Uber has more drivers in Austin than much larger Houston “due to the excessive regulations the city has enacted,” spokeswoman Debbee Hancock said. Over the past year, the company has pulled out of other cities that launched fingerprint requirements “in large part because of our experience in Houston.” She declined to say why the company is still operating in Houston. Houston’s city council is preparing to consider some tweaks to its ordinance, but the fingerprinting provision isn’t going anywhere, spokeswoman Lara Cottingham said. Earlier this year, Uber driver Duncan Burton was arrested in Houston and charged with sexually assaulting a female passenger. Burton — who previously served 14 years for drug charges — was driving for Uber without a city permit. “If the driver had been licensed by us, we would have been able to see he had been in federal prison two years ago and that he was on federal probation until 2017, both of those things would have immediately denied him a license,” Cottingham said. Uber has gotten better about kicking drivers off their system if they are not licensed with the city, she said. San Antonio has taken a different approach. In August, city leaders launched a pilot program with Lyft in which the company’s drivers can voluntarily submit to a fingerprint-based background check. Lyft users in San Antonio have the option of requesting only those drivers. An Uber official said the company is still in discussion with the city about joining the program. The size of the market and will of the local officials influences company decision in each city, said Ed Kargbo, president of Yellow Cab Austin, which is pushing for Austin to beef up its regulations. While cities carve out different paths, state lawmakers are watching closely. Earlier this year, Uber and Lyft failed in their efforts lobbying the Legislature to create a statewide licensing system for vehicle-for-hire apps. The companies are likely to try again in the 2017 session.